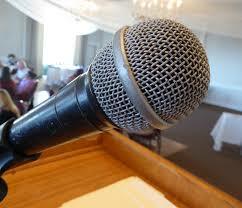 Does the world really need another blog on overcoming the fear of public speaking? Maybe ..my experience with public speaking is that your ability to manage fear and nervousness is an evolutionary process. There is no quick fix or one fits all approach. Only by speaking in front of groups countless time can you take this evolutionary journey. Every opportunity to speak is also an opportunity to overcome the fear of speaking. The first piece of advice that all speakers receive is to take 10 deep breathes before presenting. Ensure you breath deeply in to your stomach rather than you chest. Practice breathing out slower that you breath in. Breathe in for the count of 7 and Breathe out slowly of the count of 11. This is one of the first approaches I took to help manage the fear of public speaking and I must admit I only found it somewhat effective. There are a number of books on that cover the topic of breathing. This may seem obvious, but the more prepared you are the more relaxed you will be. Open with a Smile, it will help you relax and puts the audience at ease. Good Posture can be incredibly effective at controlling those nerves. Positive body language gives you confidence and puts you at ease. Weight evenly distributed on each foot. Shoulders back and chin up. Nervous energy needs to be managed, if not it will find its own way out such as swaying, moving from foot to foot, knocking knees, speaking too fast or it may affect the quality of your voice. You can channel the nervous energy in a positive manner by showing passion for your subject matter, projection of your voice, using gestures and moving around the stage between key points in your speech. At first you may find this approach “a little out there”, although its one of the most effective approach for overcoming the fear of public speaking. In advance of your speech, visualize yourself giving your speech. Imagine yourself speaking, your voice loud, clear and confident. Imagine the audience enjoying your speech. Imagine the applause from the audience after you have delivered a wonderful speech. One of the most common problems new speakers encounter is that they speak too fast. Overtime you will learn that speaking more slowly will help you relax. Practice slowing down your rate of speaking and add pauses to your speech to aid this approach. This may be the last thing you want to hear but things will go wrong – you may forgot a part of your speech, the laptop will not boot for your digital presentation. All the approaches listed so far help manage the fear but a eureka moment for all speakers is when they accept the fear. When you accept you are fearful of speaking, you can begin to question the fear. I might forget my lines, i don’t want to appear stupid in front of the group, nobody wants to listen me etc. Does it matter if i forget my lines, or look stupid, or if nobody wants to listen ?? Eventually after countless speeches you will get to the point where you confidence increases, your speaking rate slows down, the audience is enjoying your speech and you actually begin to enjoy it. If you can begin to enjoy speaking, the fear will fade it to the background. You will stop public speaking and start to simply have public conversations. There is no one single approach that will help you overcome your fear of public speaking. Although there are may different strategies that will help, you must find what works for you and overcoming you fear of public speaking is an evolutionary process. of writing here at this blog, I have read all that, so at this time me also commenting at this place.